2017 Topps Journey to Star Wars: The Last Jedi EXCLUSIVE Blaster Box-HIT Pack! 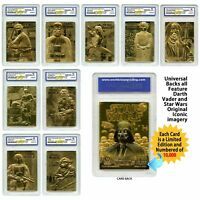 2017 Topps Star Wars: The Last Jedi EXCLUSIVE Blaster Box-SPECIAL MEDALLION !! 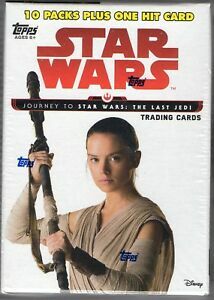 2017 Topps Star Wars Journey to The Last Jedi EXCLUSIVE Sealed Hanger Box. "Great way to build up your cards"
This is a retail blaster box of 10 packs of cards and one "hit" card. Usually in these boxes the hit is a manufactured patch or medallion card. But in these boxes you have a chance at a manufactured patch, or a sketch or even an autograph card. Most likely you'll get a patch card but I was lucky to pull a sketch card. These are the retail version of the cards so "hits" are more difficult to get than a hobby box of cards. So this blaster box is a nice way to get a chance at hits that are rarely in retail boxes of cards. You also get 10 packs of 6 cards so it is is a great way to build up your card set. I like the blaster boxes when I try to build up a set of cards. I think it is even cooler that is making autograph and sketch cards available in these boxes.